HONOLULU –– Gov. 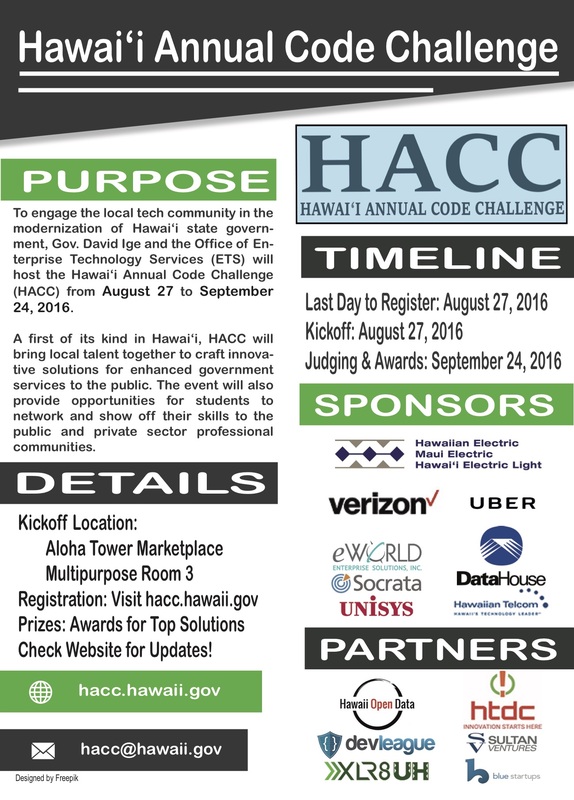 David Y. Ige, the Office of Enterprise Technology Services (ETS), and the State of Hawaii Transformation Internship Program (TIP) will host the Hawaii Annual Code Challenge (HACC) in Honolulu from Aug. 27 to Sept. 24, 2016, with a kickoff event on Saturday, Aug. 27, from 10 a.m. to 5 p.m. at the Aloha Tower Marketplace (Multi-Purpose Room 3). Presented in partnership with local nonprofit Hawaii Open Data, the month-long event is being held to engage the local tech community in the modernization of Hawaii state government. HACC is open to everyone, from students to professionals to amateurs “born to code.” Participants are invited to compete in elementary school, middle school, high school, college and open categories. A first of its kind for the state, HACC is based on the concept of a hackathon, a problem-solving event that brings together creative individuals over a set duration. Hackathons serve a variety of purposes, from exploring a new technology or programming language to encouraging economic growth through technology development, and they are often sponsored by companies, nonprofit groups, and other organizations. But rather than the traditional around-the-clock development over a single day or weekend, HACC will offer an extended period for development over one month. The kickoff event will include team formation, foundational training, and workshops. In addition, participants will select from a list of challenges themed around key problems facing the state, and then work over the next several weeks to develop their solutions. The expanded month-long timeframe is meant to encourage sustainable solutions that are appropriately matched with technologies and platforms in use or being considered by the state. Participants will return on Sept. 24 to present their solutions for judging and winner selection. Awards will go to top participants, and outstanding projects will be considered for implementation. Rules and judging criteria will be announced prior to the kickoff event, with the list of challenges to be announced at the event itself. Prior to the kickoff, participants are encouraged to submit their own ideas for state-related challenges facing the citizens of Hawaii. Submissions will be considered for inclusion in the challenge pool. For more information, latest updates as well as registration and challenge idea submission, visit HACC.hawaii.gov.